So, what is this blog hop anyway? A blog hop is also known as a link party. In this one, designers are coming together to offer you all sorts of great stuff and deals to give a jump start to your holiday crafting season. 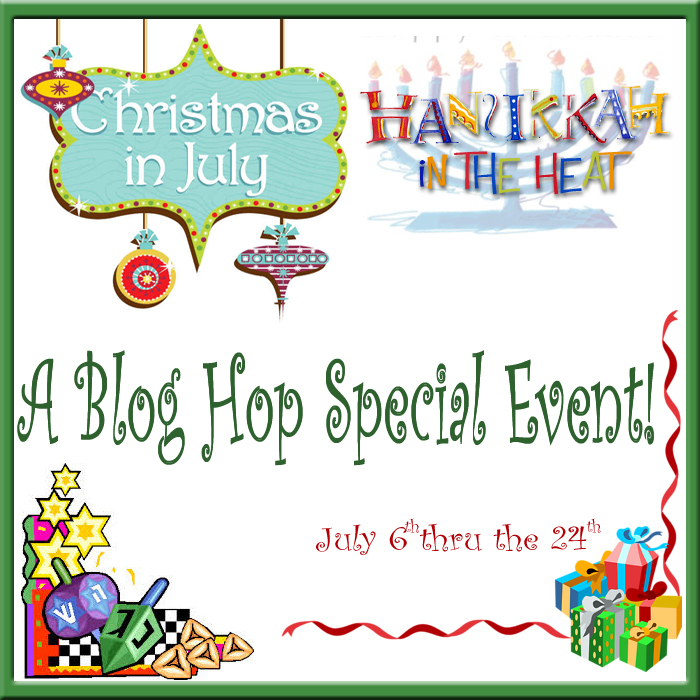 The Christmas in July ~ Hanukkah in the Heat Blog Hop Special Event runs from July 6th through the 24th or while supplies last. Each designer is listing their own offers. From one of a kind sample pieces to discounts on patterns to daily coupons; there is something for everyone! Each designer is responsible for the content and sales on their own site. If you have any problems at any given site, you should contact that site owner. What I have to offer will be listed below and then you can click the buttons to “hop” on over to the other participants. **For my non crafter friends, I offer you all free shipping (in the U.S. only) or 15% off your total purchase of my ready to ship items, you may choose which one you would like. Depending on what you get the 15% may be a greater value! Click on my logo to head to my ready to ship folder on my Facebook page! **For my crafty friends, I offer everyone 40% all of my patterns in my Ravelry store! This is not limited to just one pattern. Click the Ravelry button below to go to my Raverly Store. These links will connect you to my Facebook Ready-to-Ship album and my Ravelry page! Click the link to the left to head on to the American Crochet blog head by Mistie! The Crochet Memories blog is next on our list. Click the logo to go check out the great deals Cylinda has for us! Darcy has some awesome deals on her blog Darcy’s Crochet Creations! Leah runs Creative Threads by Leah and I know she is going to have some fantastic sales on her page! Michele heads the Mainly Crochet blog. Click her logo on the left to see all the lovely things she has going on! Marie runs the Underground Crafter. Click on her logo to see what all she has going on for us! Come visit Rebeckah’s page for some weekly deals throughout the blog hop! Last but not least, is Deborah of From Grammy’s Heart. She is the organizer of this blog hop and has loads of great sales and items in store for you all!